Snuggly (Warm and Fuzzy) is a special Character in Dark Souls and Dark Souls Remastered. Located in the Northern Undead Asylum, she will trade items with you. To trade, drop the item you are offering, then quit your game and reload. When you come back, your reward will be in the nest. In the Northern Undead Asylum, after the door opened post-fight with Asylum Demon, there's a path going up towards a large crow. Snuggly can be found by going up that path and then taking a right about mid-way, it's nest with blue eggs on a small ledge. Note: You do not have to save and quit the game to trade items (Xbox One you do). Simply jumping off the edge to your death and then re-spawning at the bonfire will have the same effect.You can also use a Homeward Bone or equivalent. As long as your game has to go through a loading screen, Snuggly will have your exchanged item. IMPORTANT: Only one item is exchanged at a time. Dropping more than one of an item, either separately or in a stack, or dropping different items and trading it away will result in the exchange of only the last item dropped, and the loss of all the excess items, without any additional gain. Only drop one item at a time. This barter merchant is located in the Northern Undead Asylum, she is accessible the moment you beat the first boss of the game (not many people have something to trade at this point in NG, though). 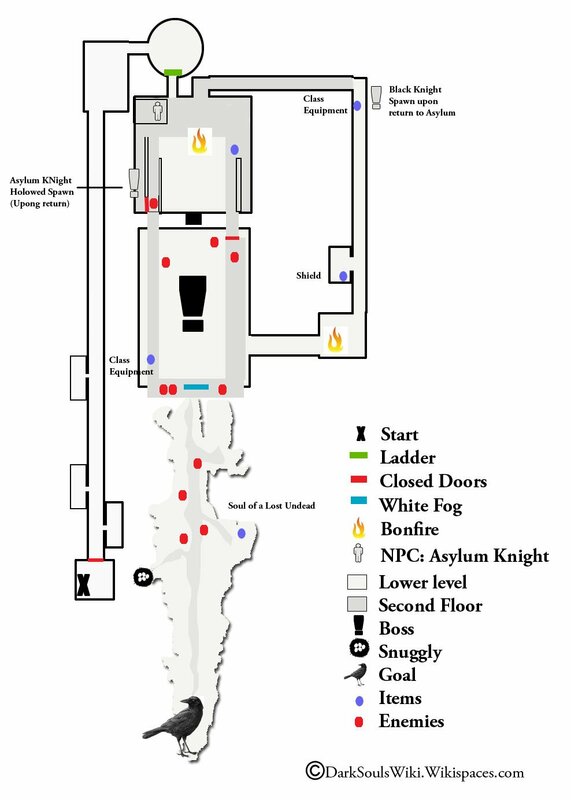 After stepping out from the large crow's nest and facing towards the Asylum, Snuggly's small nest is located a bit downwards and to the left (before the torch Hollows). Once you trade an item, you cannot trade the same item again on the same playthrough. If you drop an invalid item inside the nest Snuggly will tell you if she doesn't want it, either saying she has enough if you already traded that item or that the item isn't soft and warm if she doesn't want it at all. If she says nothing (and you dropped the item in the correct location) she will carry out the conversion as soon as you leave the area. 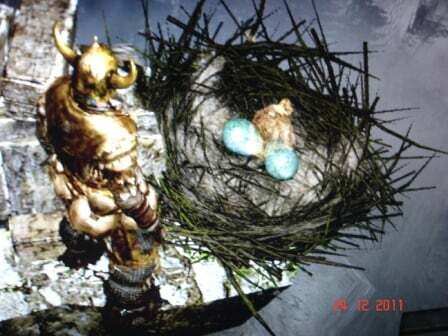 It is important to drop the item into the nest. It will be gone if you drop it in front of it. For the Pyromancy Flame trades, Snuggly will only accept flames without any additional upgrades (+1, +2, etc). Upgrade the Pyromancy Flame to +15, then ascend it from the Blighttown swamp NPC to the higher level Pyromancy Flame (can be upgraded to +5 eventually), trade this ascended version with Snuggly will gain a Red Titanite Slab. Before patch 1.05 you could trade items with Snuggly infinitely or so as long as you had the item to trade (do not try it now). Place the item you want to trade in the nest. Quit and reload (or die, but that's slower). BEFORE you pick up the item Snuggly gives you, drop another (identical) item, if you change the item type, you wont be able to trade that one again until next play through. Now pick up the item she gave you. If you are trading for twinkling titanite and run out of the moss clumps you are trading, you can just leave the last traded titanite there and continue at a later time. On Remastered I&apos;m not getting anything. My dropped items disappear, but there&apos;s nothing in return. In dark souls remastered I meant in my posting above. Snuggly is not working on the second time around. It&apos;s not sqwakin or anything. I left rubbish with no luck. What&apos;s up? Snuggly is not working on the second visit. It&apos;s not sqwakin or anything. What&apos;s up? I left rubbish with no luck. Is Snuggly the only NPC you can&apos;t kill? what gender is Snuggly ???? im on NG+3 on the PS4 version of the remaster 1.01 and snuggly wont show himself ... i tried everything , hope this will be patched soon ! My game is not updated so thanks for the item trade. I was able to get the dragon Torso Stone. Dropped single, valid item in the center of the nest. Quit game, reloaded. No item for me to pick up. Tried again in a slightly different location (in the nest). Still nothing, and now I&apos;m out of those items. Not happy about it. Don&apos;t quit the game to reload unless you want to lose your items for nothing. "(or die, but that&apos;s slower)"
Snuggly was an NPC in Demon&apos;s Souls. The name carried over when a popular player from the time accidentally called him so.